4 reasons you shouldn’t be feeding the pigeons. 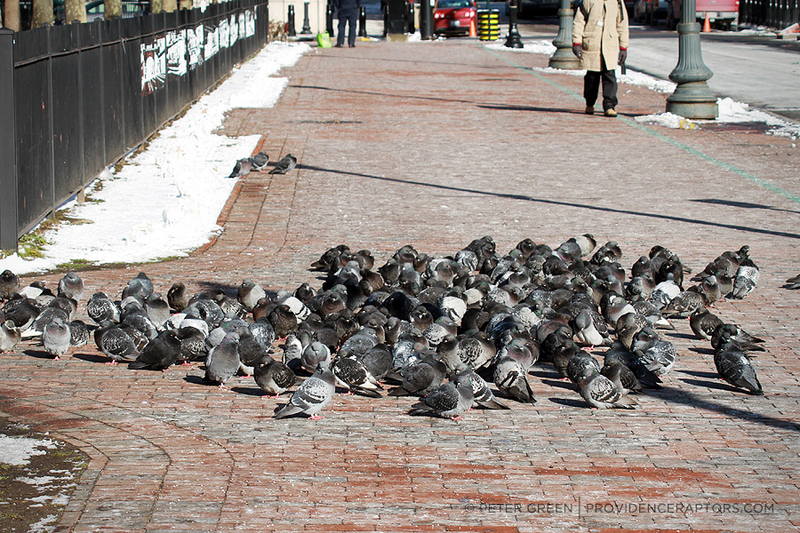 All of us at the Downtown Providence Parks Conservancy love animals but know that it is important never to feed the pigeons in Burnside Park and Greater Kennedy Plaza. It may seem like it’s helpful to the pigeons, but it actually has the opposite effect. Whether you actively feed our park’s pigeons or just leave your leftover food on a bench for the pigeons to find, feeding pigeons has serious consequences for the birds, the people who use the park, and the park itself. Here are 4 reasons you shouldn’t feed the pigeons. It actually hurts the birds! Pigeons have to maintain their natural ability to scavenge and find food for themselves. When they are fed by people, they lose that ability and become dependent on people for their survival. Food feeds more rats than it does pigeons. Rats sustain themselves through food scraps, and burrow into parks where they find a steady supply. Let’s get the rats out of downtown Providence by getting rid of their park food supply! 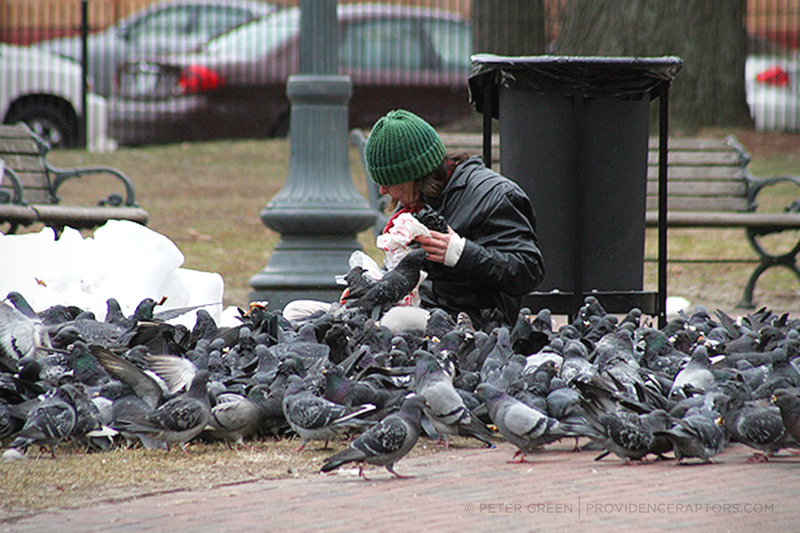 Overfeeding creates a health hazard for both pigeons and people. Overfed flocks of pigeons multiply at an unnatural rate. Large flocks unable to sustain their population suffer from disease and starvation. Large numbers of pigeons also pose serious health risks to the general public. Pigeon droppings can cause human diseases like Histoplasmosis, Cryptococcosis and Psittacosis. Bread is not a healthy source of nutrition for birds. White bread contains none of the fats and proteins pigeons need to sustain their daily health and energy. Pieces of bread that are too large can potentially cause digestive blockages. 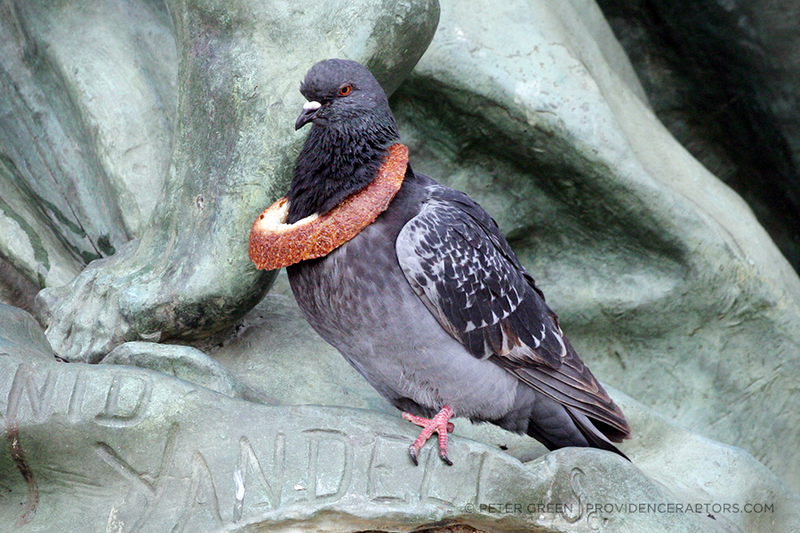 Also, bread left outside quickly develops mold, which makes birds ill. Pigeons are also part of the food chain. A healthy pigeon is good food for our neighborhood Red-Tailed Hawks which feed on them. Next time you have stale bread in your kitchen, spare the birds and use that bread to make some bread crumbs, croutons, or delicious bread pudding! Together we can keep our animals healthy and our parks clean. 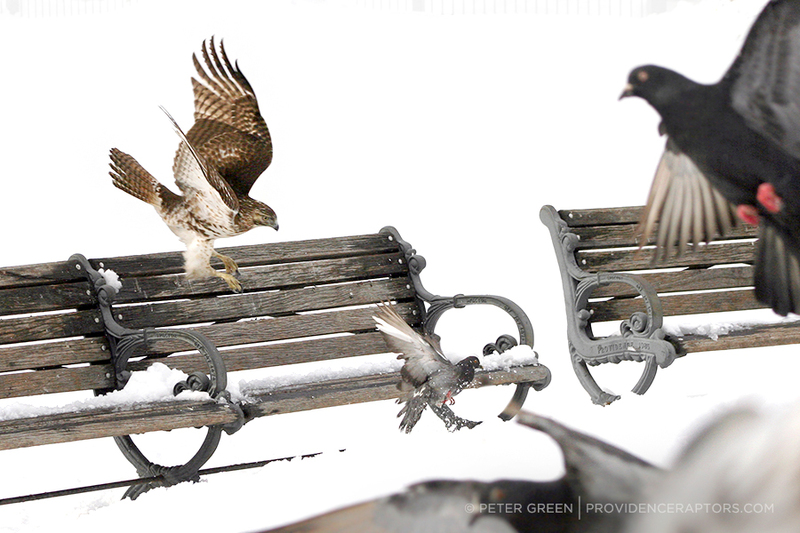 Special thank you to local photographer Peter Green of Providence Raptors for giving us permission to use his photos of downtown pigeons.